Josh Endsley of Bainbridge is shown pulling his ice fishing equipment across the frozen Rocky Fork Lake on Thursday. Josh Endsley is shown on the ice at Rocky Fork Lake Thursday afternoon wearing a full-body flotation suit. Weather conditions that kept many Highland Countians indoors on Thursday were no match for Josh Endsley of Bainbridge, who enjoyed a leisurely but bone-chilling afternoon ice fishing at Rocky Fork Lake. Endsley was seen on the ice wrapped from head to toe in a flotation suit fishing for perch, and while he said conditions were good, the fish weren’t biting in his North Beach fishing spot because the water temperature was a little too low. Endsley said the water temperature should be around 39 degrees for fish to bite, but near North Beach, the frigid water was closer to 37 degrees. He later moved to an area where the water was warmer. Rocky Fork Lake Natural Resources Officer Adam Somerville said the park office has ice rescue equipment on hand in case of emergencies, including a life vest for one victim, 50 feet of rope, a small ladder and a flotation suit for the rescuer. 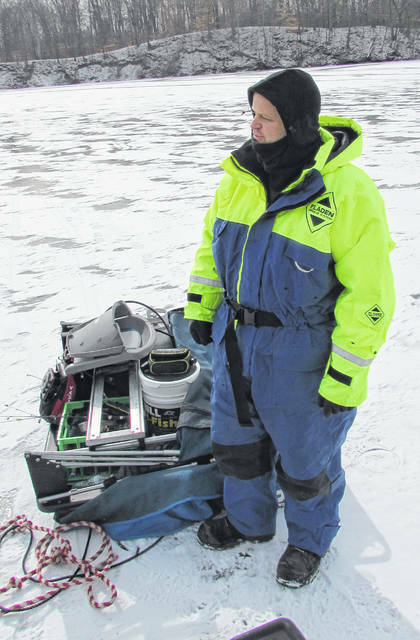 Somerville said if someone fell through the ice, he would jump into the gear and get to work. 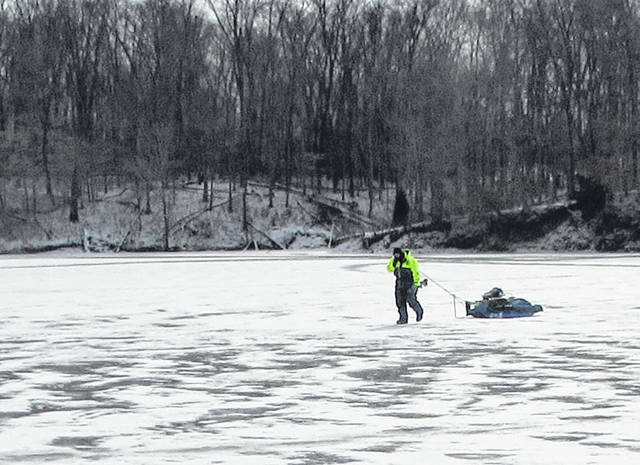 According to Somerville, a key point for ice fishers to remember is to share a “float plan” with friends and family so they know when fishers be out on the ice, where they will be fishing, where their vehicle is parked and when they plan to return home. He said for everyone to remember that “no ice is safe ice” and to always be prepared for an emergency.